Q: Our patio deck has a number of low areas that turn into puddles when it rains. Is there anything we can do to remedy this? A: Patio decks should be for lounging, not tiptoeing though puddles. These low areas on decks can cause discomfort, not to mention tracking a mess into the house. It is difficult to patch these low areas because different surfaces such as aggregate concrete, vinyl fabric and roll-on coatings are not compatible with patching. One idea is to use duck boards. These have been used very successfully on decks with poor drainage. To make your own duck boards, use 1 x 2 clear cedar strips, 24 inches long. Using 11/4-inch galvanized box nails, nail the strips to four pieces of 1 x 2 running in the opposite direction underneath. These are called runners. This will make 24-inch-by-24-inch squares. You can lay these in opposite directions to give a parquet look design to your deck. And the best part is that the water will fun freely between the 1 x 2 runners away to drains, leaving a dry surface to walk on. 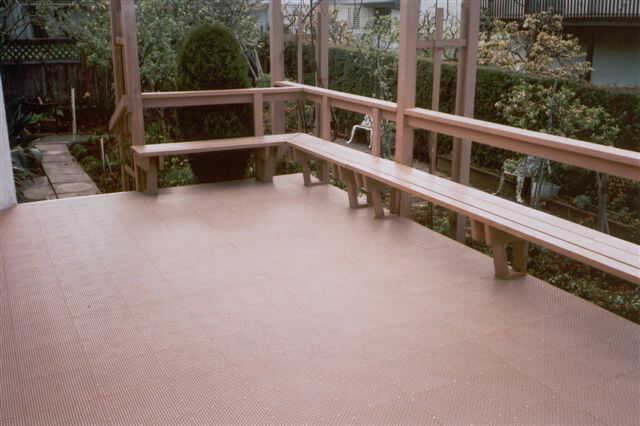 There are also various plastic grids available on the market, that are made for the same purpose. Check your local building supply store for availability.